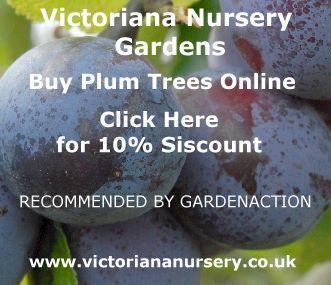 Plum trees should not be the first choice of fruit tree for the totally inexperienced gardener, but with a little knowledge they are not too hard to grow - read on and let GardenAction show you how. Standard or bush) 25 kilos (58lb). Greengages - 12 kilos (28lb). Give careful consideration to what type of plum tree is best for you. 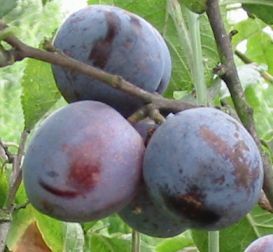 Buying a plum tree which might grow to 9m (30ft) tall producing masses of cooking plums is not a good idea if you have a small garden and want eating plums! The three key factors in choosing a plum tree are size, taste and pollination. GardenAction explains all three. Fan trained plum trees grow to an eventual height of around 2 m (7 ft). Although the shortest of all the forms, they will grow to a width of around 3 m and are really only a practical proposition when grown against a wall (not north-facing). If you have that sort of wall space available, this is the form for you. Bush trained plum trees are free-standing and are taller than the pyramid form - around 4m when mature. They do have one advantage over the pyramid form however, the branches and foliage is held around 1 m (3 ft) high from the ground - this makes mowing around the tree much easier. The downside is that some of the fruit will be too high to pick without the use of a ladder. Half Standard trained plum trees are again free- standing and will grow to a height of around 6 m (20 ft). This is a largish tree and only suitable for medium to large gardens. It will produce a mass of plums each year, most of them needing a ladder to harvest. Standard plum trees reach a height of around 8 m (28 ft) at maturity - on your own head be it if you plant one of these in anything but a large garden. They will produce enough fruit to feed your entire neighbourhood and you will definitely need a decent sized ladder to pick most of the fruit. Message: Sharon H. That is horrible. My first inclination would be water the plum tree more. I hope I get some answers to mine. Message: I have a home in Atlanta. I want to plant plum trees down the side of my yard about 5 feet from the line and for the duration of the 140 feet back. We have plenty of neighbors who can help harvest and eat them all. I would like to get as many different varieties as is right here. I don't know what to buy or where to buy them. Message: Prune young trees in winter for shape,in summer for fan training older trees and to remove unproductive wood. Hard pruning stimulates side shoots. Take laterals back to two thirds in winter. Message: We live in Buckinghamshire, England. Can you please tell me what time of year we should prune our plum trees? Message: where are those answers???????? Message: I have several of the same questions as others do on this page - but where are the answers? Is anyone posting answers somewhere so I can see what to do??? Message: 2 years ago my plum tree blossomed profusely and bore fruit which was 90% defected by a clear, sticky, oozing gel. The unaffected fruits were great. This spring, I had fewer blossoms and fruit. As soon as the green plums got to be an inch in diameter, The ooze began and every fruit on the tree was gone within a day! What's happening? Yhank you or any help. Message: I have the same problem as E Lowe. A big heavily-laden branch has just snapped off but I've now got a bag full of full size but hard, green victoria plums. Can I do anything to ripen them or are they lost? Message: I have a plum tree which this year is so heavey with plums that the braches are being dragged down almost to the ground. I have managed a device to support the weight but another plum laden branch has actually snapped off with loads of fruit (boo hoo, lost them then! Will this snapped branch cause any long term damage to the tree? Message: I moved to a house that has a mature plum tree,but the unripe friut was falling off all sring I only got one perfectly ripe plum it was wonderful,but there were no more left on the tree by the time they were ripe ! Is there something I need to do ? Message: This is the first year our Stanley plum tree (it is around 6 years old) has produced more than one plum. It actually has many plums on it - - however - - they have stopped growing and are now dropping from the tree. They are green and only about 1 1/2 inches long. What is wrong? Please, can you help? Message: Hi I have tiny little green bugs on my plum tree, they are like greenfly but i dont think they are. last year i had lots of plums this year i have none. they are even crawling on my garden bench which is near the tree, also lots of wasps in the tree, any idea what they are. Message: My plum tree is about 6yrs old. I started getting plums the 3rd year. Each year after it started getting a black hard something on the branches. It's getting worse. What could it be? Message: when do they start gettig purple ready to eat my tree is large but they are still very green on the outside.some are really red in the inside.why are they takeing so long to ripen! Message: This is the first year our plum tree is so full of plums it weighs the branches down. However, there is some clear liquid like balls hanging near some of the plums on the branches. What is this? Message: My tree is 7 years old a dwarf. This year I noticed a hard growth on various branches. It looks like bark that wraps around a small part of the branches. Also there are a few bugs that look like lady bugs. Message: My plum tree just dropped almost all its golf ball size fruit. Why did this happen and what can I do to prevent it? Message: How can I protect my victoria plum trees from insects getting insite the fruit. Should I spray them with something?